The food: Cheesecake—especially the classic baked New York style—is a true crowd pleaser. Its rich, creamy flavors appeal to most tastebuds, and both the taste and the appearance fool people into thinking it is difficult to make. In fact, it’s a relatively simple dessert that requires very little skill (although it does demand a lot of patience, as you have to wait hours to eat your creation). 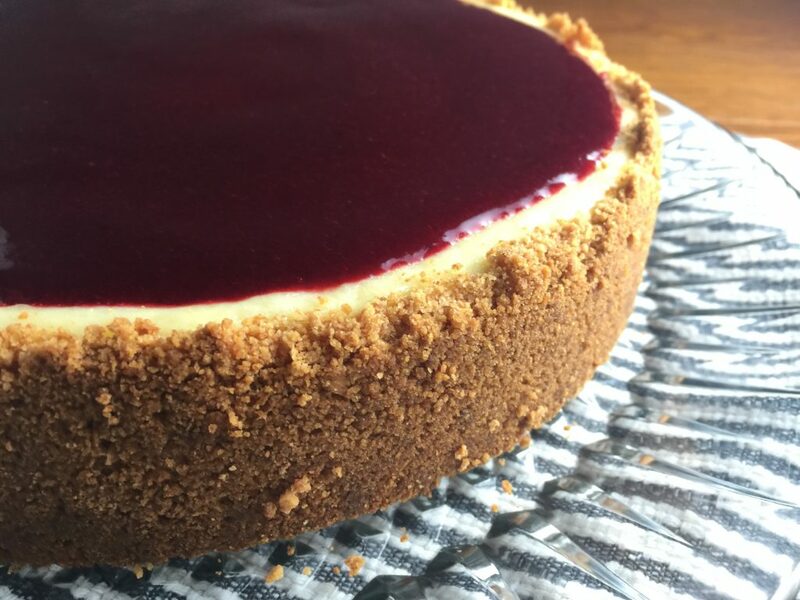 When I make this easy version, I use cinnamon graham crackers to give the crust a little zip, and top the cheesecake with blackberry compote for more depth and sweetness. The music: Just like this baked cheesecake, Ella Fitzgerald’s voice is timeless, decadent, and nearly universally loved. She’s the queen bee of jazz. Any of her albums will improve your cheesecake-making experience, but I chose the upbeat “Clap Hands, Here Comes Charlie!” from 1961. Take your time with the prep work on your cheesecake, so you can enjoy all 14 songs on this great studio album. If you have a little time left over at the end, sit down with a glass of white wine and read the erudite liner notes written by Benny Green of The London Observer. They are sure to make you long for the days when words truly meant something…and may also make you blush as you reach for a dictionary. 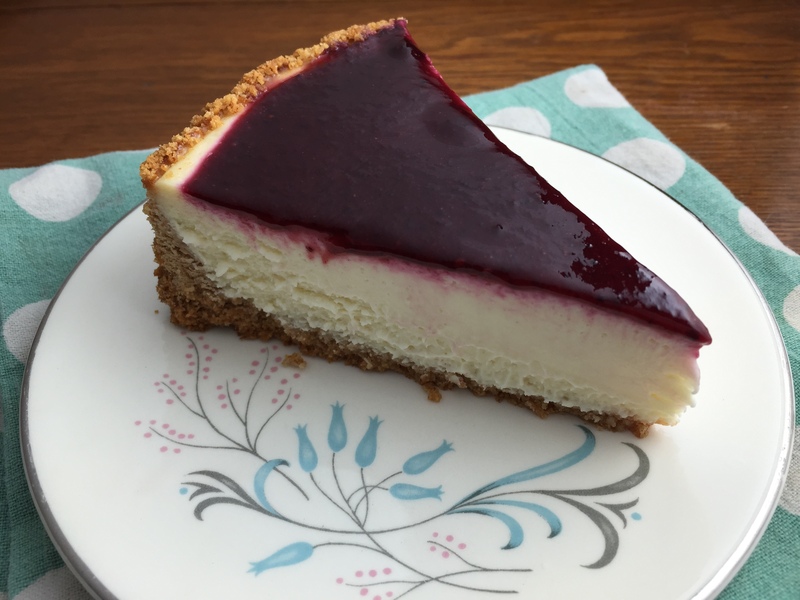 Serve the cheesecake with warm compote, or refrigerate it for a few hours to let the topping thicken and become more like a blackberry jam. It’s pretty darn tasty either way. 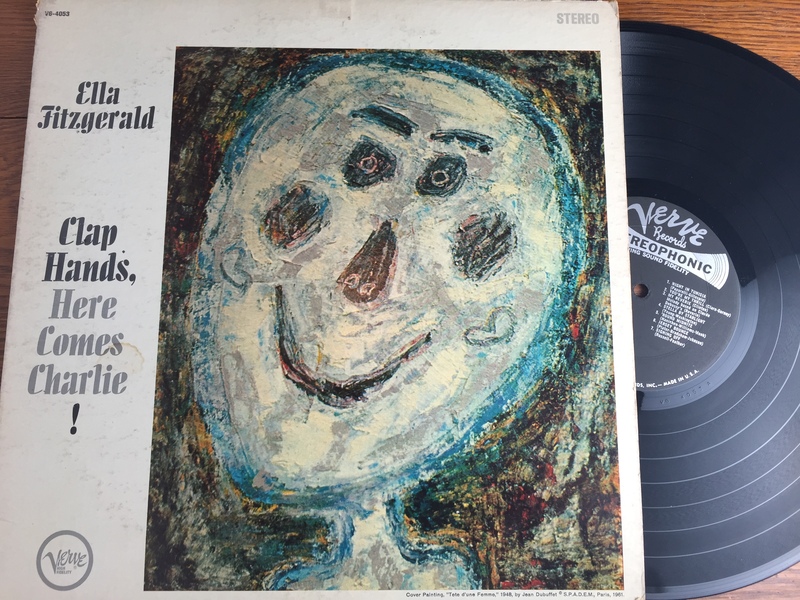 Want more Ella Fitzgerald? Find another of her albums with my recipe for Moist Chocolate Cake. In medium bowl, mix crackers and butter with a fork. Spread into the bottom and up the sides of a greased 8-inch springform pan. Set aside. In a large bowl, use an electric mixer to beat the cream cheese on low until smooth. Add one egg at a time, beating until each is combined. Add sugar and beat until creamy. Add sour cream and vanilla until well combined. Bake 40-50 minutes, until cake is firm but still jiggles slightly. Let cheesecake set for 30 minutes before placing it in the refrigerator to cool (covered with aluminum foil) for at least 4 hours. Use a knife or spatula to loosen the edges of the cake before releasing springform pan and transferring to a cake plate. Warm blackberries, sugar, and lemon juice over medium heat until sugar dissolves. Puree in a food processor. Strain out seeds. Pour over cheesecake. This looks amazing! I don’t get blackberries often enough, but I know my kids love them. I definitely have to try this cheesecake! It’s pretty tasty! Thanks for stopping by and reading! I LOVE Ella & cheesecake! MMMM Thanks for visiting and following along at 4 You With Love. I’m following you as well! Here’s to creating and blogging fun & success! Agreed! Hope to stay in touch! Gorgeous and DELICIOUS looking cake!! Oh this sounds so good! I’ve been meaning to try making cheesecake from scratch. This simple recipe seems like a good place to start! Thanks for sharing it with Hump Day Happenings. Um, wow. This cheesecake looks AMAZING Becky! I’ve never actually made cheesecake before, but thois one looks so good I’m going to have to give it a try. And I love the idea of using cinnamon graham crackers for the crust—GENIUS! Thanks for sharing this delicious recipe!